In March, I visited Mike and Joannie in Chicago. Originally, I planned to take them to Alinea for dinner, but it hadn't opened yet. Fortunately, Chicago hosts more than one "post modern" or "avant-garde" cuisine restaurant (this food movement has yet to settle on a term for itself, and molecular gastronomy is not the most appetizing of terms). Chef Ferran Adrià is widely credited with founding this movement with his restaurant El Bulli, situated a few hours north of Barcelona and voted best restaurant in the world by Restaurant Magazine just a few years back. 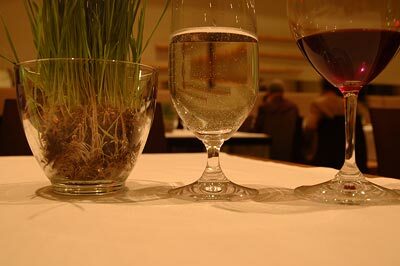 Besides Alinea, Chicago also hosts chef Homaro Cantu's Moto and Graham Elliott Bowles Avenues. I opted for Moto. Located on Fulton St., Moto is a bit cool in atmosphere, and on this Wednesday night (Mar 16), the austerity was amplified by the emptiness. 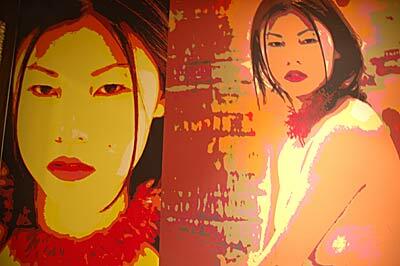 We were one of just three tables occupied, and the hushed silence caused the three of us to whisper subconsciously. I killed my cell phone even before reading on the menu that "moto is a cell phone free environment unless we issue one to you" (italics theirs). One data point can't be extrapolated in any direction, but the restaurant is a bit out of the way for a Tuesday night feast for working folk. The lighting is quite dim inside. The website explains: "the minimalist decor of the main dinning room allows our guest to focus on the main attraction: Chef Cantu's food." I maxed out the ISO on my digital camera and still could have used a tripod for pics (as some of the blurry shots below will attest). I'd love to see mini spotlights at each table, perhaps on telescoping arms, or from mini table-standing lamps, or even hanging on long cords from the ceiling, to highlight the colors of the food. Ones eyes can't make out the color and texture of the food as well when everything is bathed in dim lighting. Moto offered three tasting menus. The base menu includes five courses for $65, the next step up includes ten courses for $100, and the grand daddy is the Grand Tour Moto (GTM), eighteen courses for $160. The GTM is described on the menu as "the best way to experience our vision in the post modern movement," but my wallet's appetite could only stretch to the ten course taster. Our waiter told us that all three tasting menus included the same amount of food, and the thought of the portions in the GTM gave new meaning to molecular gastronomy. 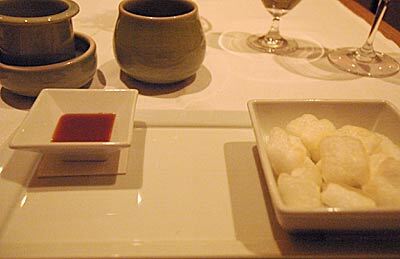 Our first course was the sushi cartoon, one of Moto's more famous dishes. Homaro Cantu had devised a means to feed food dyes through an inkjet printer, and this roll of sushi included photos of the fish printed on the outside of the rice paper wrapping. Novel, but more interesting conceptually than taste-wise. Cantu has a patent out on this method of printing on rice paper, and our waiter noted that Cantu hoped to enclose flavored rice paper in plastic for distribution in magazines and other outlets in the future. The culinary equivalent of perfume samples in magazines, it might be a way to market a restaurant directly to diners' taste buds. Course two was champagne & king crab. 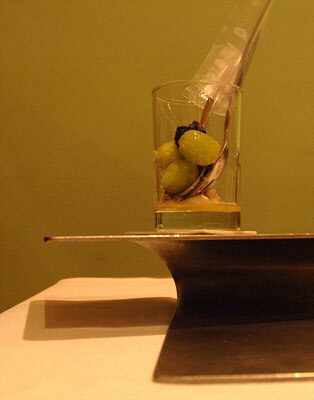 The grapes in the photo had been carbonated somehow (with a syringe?). Each bite provided a fruity fizzling in the mouth that took me by surprise, and the dry champagne and sweet-tart grape complimented the salt and seafood flavors of the sturgeon and king crab nicely. See the piece of plastic below? It housed another of Cantu's inkjet creations. In this case, he had printed a piece of rice paper with the flavors of the dish below. After eating the dish, we were told to put the "negative" on our tongue for "developing." The result, if executed properly, was to be a reminder of what we'd just had. Cantu named this concoction deja vu. I didn't follow directions and got the negative stuck on the roof of my mouth where, presumably, humans have few if any taste buds. Joannie's negative stuck to the roof of her mouth also, suggesting that the deja vu idea needs tweaking. The result was more of a fuzzy Polaroid than an Ansel Adams print, but I still loved the dish. Course three: French onion soup with a hot - frozen crouton. 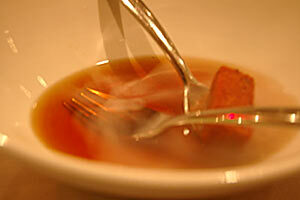 The waiter added a cube of liquid nitrogen at the table to cool the soup, causing smoky plumes to emanate from the bowl. The waiter explained the reasoning behind the liquid nitrogen, but I don't recall the details. Perhaps rapid cooling locks in the flavor in a more concentrated fashion? Dish four: lobster with freshly squeezed orange soda. The orange is to the right in the photo below. 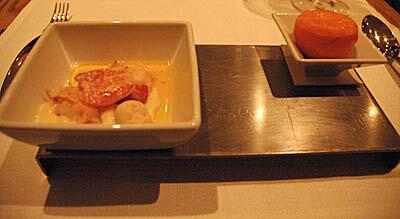 The lobster was served over pureed celery root with brown butter icea cream. The orange, like the grapes earlier, had been carbonated. I'm a fan of the carbonated fruit. It adds a playful touch to the traditional palate cleanser. The lobster was magnificent. 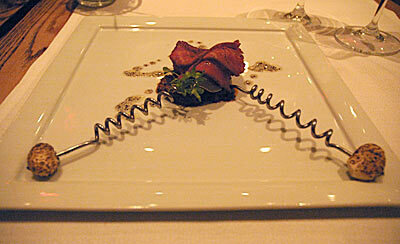 I love lobster, and any dish that incorporates lobster has to let the lobster be the center piece. Let lobster be lobster. This dish did. Dish five: sunchoke, lemon, thyme, & kalamansi. Our waiter filled in the details: sunchoke (Jerusalem artichoke or sunflower bulb) sorbet, lemon and thyme jelly, and kalamansi foam. Kalamansi is a Japanese citrus fruit. The foam texture is said to deliver a more concentrated dose of Kalamansi flavor, but I'm not sure I've ever had Kalamansi so I can't comment on the success of the technique. 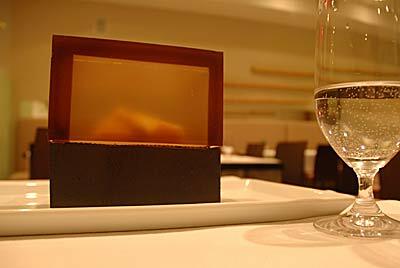 Before bringing out dish six, our waiters brought out a thermal polymer box heated to 400 degrees. Inside rested a raw piece of monkfish, soon to be dish number seven after it finished cooking on our table. 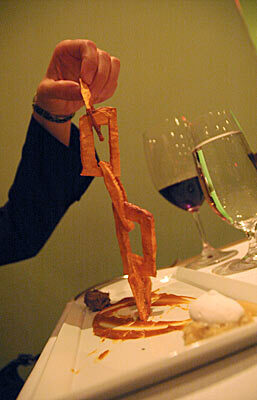 Until then, dish six: french fry potato chain links with sweet potato pie. The potato links were carved from one potato. To the left below: porcini mushroom ragout. To the right: fennel and cabbage topped with juniper marshmallow. Below, Joannie demonstrates that the potato links indeed formed a continuous chain. This is something I did not learn in my knife skills cooking class. The cook learned the technique from Andre Soltner of the French Culinary Institute in NYC. I'm quite certain it's something I'll never attempt. Dish seven: monkfish bouillabasse. The waiters removed the monkfish from the thermal polymer box and placed it over bouillabaisse made from powder and the juices of the monkfish itself. Dish eight: prime dry aged beef with braised pizza & garlic. What makes the dish noteworthy is not the democratic inclusion of pizza but the utensils. 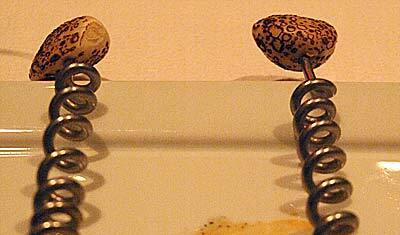 The top of both the spiral metallic fork and spoon speared a grilled(?) clove of garlic. Before each bite, we were to smell the garlic. This, the waiter explained, would fool our taste buds into tasting garlic without actually having to eat it. The effect was mild, but I had a stuffy nose. I have no problem with garlic breath, so I'd prefer my garlic in my mouth, but the beef and pizza combo was still a winning one. Dish nine: doughnut soup. The blurry shot below is just a bit below actual size. We each received an espresso-sized shot of this dessert, and it was my favorite of the night. I don't have the adjectives to describe it, but just imagine drinking a Krispy Kreme glazed donut. 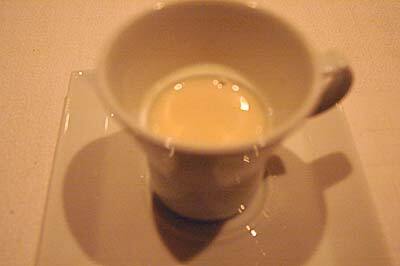 The liquid had the consistency of skim milk, and the flavor was just the right level of sweetness. This is a shining example of where molecular gastronomy goes right. It's as if the flavors and smells of a donut had been magically distilled into liquid form, delivering something that tasted more like a donut than a donut itself, if that makes sense. I had to know how the dish was made, and our waiter provided a brief description which has blurred over the passage of time. I believe they boiled a few Krispy Kreme donuts in milk, then strained the liquid and added sugar. Then they pureed a few Krispy Kreme donuts, mixed it all together, and strained the liquid out again. I hope Cantu (or is this the work of pastry chef Ben Roche?) releases the actual recipe someday because this is something I'd try and make at home. I hope to attempt this soon, and if anyone wants to trade recipes or secrets, do e-mail me. Avant-garde cuisine has spiced up the dessert canon with its willingness to tap fast food and school lunch snacks. Another Moto dessert is Kentucky Fried ice cream (tastes like fried chicken! 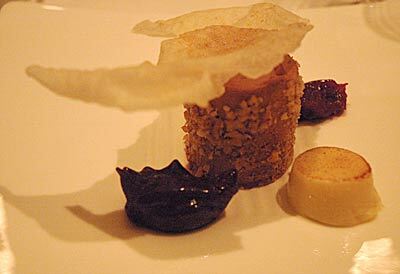 ), and chef Bowles at Avenues incorporates Rice Krispie treats in one of his dishes. Lastly, manjari chocolate cake with hot ice cream. The flourless chocolate cake was covered with walnuts and filled with maple syrup that gushed out once I breached the outer wall with my spoon. No, wait, another dish, courtesy of the kitchen. Packing peanuts. The texture was that of, well, packing peanuts (when avant-garde cuisine succeeds, dictionaries fail because the food tasted just like it's named), the taste was that of popcorn, complimented by a caramel dipping sauce. We also opted for tea to conclude our three hour plus meal, having as one of our selections a tea called Iron Goddess of Mercy. Our waiter shared its history. This reserve grade oolong tea was made from a 1400 year old tree. It gained its exalted status after curing a Ming Dynasty emperor and was made from only the middle leaf of the three leaves on the end of each branch. Why only the middle leaf? I don't know, but it makes for a good story. 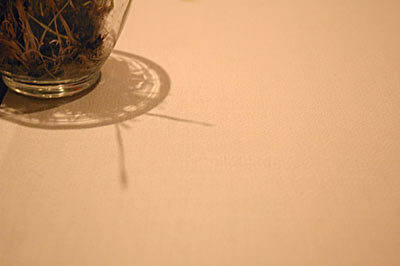 Our waiter, coincidentally, had trained under Grant Achatz (of Alinea fame). He had nothing but praise for Achatz and was training to open a place of his own in the future. All waiters at Moto work in the kitchen as well, and our team of two or three waiters were trained in the techniques of high-end dining service. 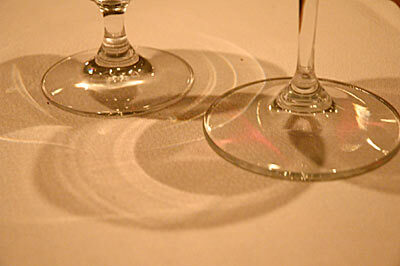 All our dishes touched the table at the same instant, and all wine labels were rotated towards diners while being poured. Occasionally, a waiter would even come over and adjust the placement of my wine glass which was too much attention for my taste. 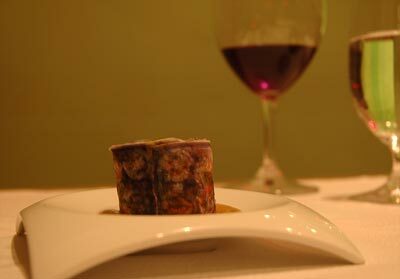 The timing of the arrival of each course was precise, so I can't imagine how long the GTM might take. One might be at the restaurant for four or five hours. One last surprise remained. Our waiter had noted me jotting notes in my notebook and snapping the occasional photo, and he'd fielded many more questions from us than the other diners. When our check arrived, he brought with it a laminated copy of our menu, dated March 16, 2005, signed by chef Homaro Cantu! A perfect memento of an already memorable meal. My lasting impression of Moto and avant-garde cuisine is a positive one. I'm as much a fan of simple cuisine as anyone (especially in my own kitchen), but letting my tastebuds experience sensations and flavors they've never been is the equivalent of traveling to undiscovered countries. The mixture of familiar cupboard favorites (A-1 steak sauce, e.g.) and childhood favorites (PBJ, cotton candy, e.g.) with expensive ingredients (foie gras, lobster) is not just playful but often successful, and many of these dishes are not just gimmicks but successful attempts at extracting flavors in their purest forms for seamless and intriguing integration. This food movement is still young, and as such, some of the chefs' attempts will be unsuccessful. 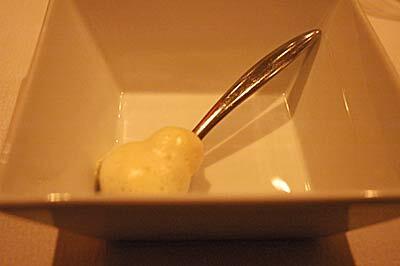 However, we have enough restaurants that know how to crank out steak frites, braised lamb shank, or Chilean sea bass, and only a handful of offshoots of El Bulli experimenting at the frontier of cooking. At this point in the movement, the risk-reward ratio for both the chefs and a foodie like me is still far in favor of experimentation. Foodies already treat meals as events, and they're the target audience here.